I took some time out of my day to kick back and watch a movie because seriously… I just wanted to indulge myself and be lazy. So now, instead of feeling guilty, I’m so thankful because this has to be one of my all-time favorite movies to date. Shouldn’t we all take that quote to heart? Do yourself a favor and watch this sweet little gem of a movie. You will smile. 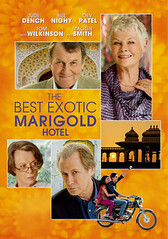 This entry was posted in Check this out!, Just me, Random, in other words, nonsense and tagged Best Exotic Marigold Hotel, Bill Nighy, comedy, comedy drama, entertainment, Film, hollywood, India, Jaipur, jaipur india, Judi Dench, Maggie Smith, running the gauntlet, Tom Wilkinson. Bookmark the permalink. I just saw that this week. Loved it!